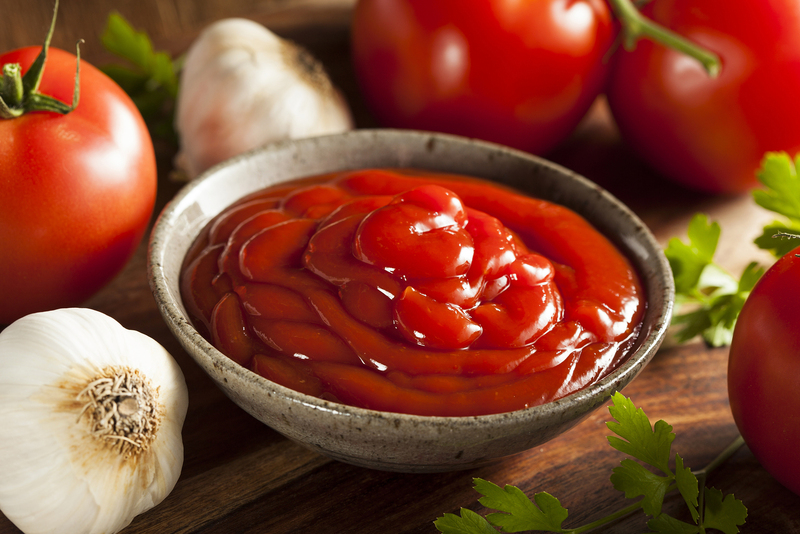 Byron H. asks: Why is it sometimes catsup and other times ketchup? Today often disdained as low-brow, when it was first conceived, ketchup was revered for the flavor it added to foods. Initially a paste made from fermented fish guts, it was first recorded in 544 BC in Important Arts for the People’s Welfare; according to the legend, while in the course of pursuing his enemies, emperor Wu-ti came across a pit filled with fish entrails and covered with dirt from which “a potent, delicious aroma,” could not help but emanate. For some reason, they actually ate it, learned to love it and at first named it Chu I. (Worcestershire Sauce also has a similar slightly stomach turning origin, only in this case is still made pretty much the same way it was in the beginning.) Eventually, Chu I evolved to kôe-chiap or kê-chiap. Over time kôechiap migrated and made its way to Indonesia where it became known as kecap. British sailors were trading there by the 1690s, and it is believed they developed a taste for, and began exporting, kecap from the East Indies during this time. Also in the 1690s, Brits began tinkering with the sauce’s name, and catchup, which, according to the OED, was a “high East-India Sauce” first appeared, while by 1711 others were using the spelling, ketchup. Nonetheless, it appears that both words were still describing a type of fish sauce . . . although by this time, rather than fish entrails, salted anchovies were fermented. Anchovy ketchup quickly became popular in the West, and recipes for it can be found as early as 1732; by 1742, some recipes had even begun to put a definite British twist on the sauce by adding to the anchovies, “strong stale beer,” mace, cloves, pepper, ginger, and shallots. Nonetheless, as anchovies were not always at hand, and necessity being the mother of invention, cooks in the west began experimenting with different ingredients to form the base of their ketchups. Two that quickly became popular were mushrooms and walnuts. In 1747, Hannah Glasse included a mushroom ketchup recipe in The Art of Cookery, Made Plain and Easy, and it involved several steps including salting the mushrooms, then boiling, straining, skimming, straining (again), boiling with ginger and pepper, straining (again) and then bottling the mixture with mace and cloves. Another 18th century variant, a family recipe from that of noted novelist Jane Austen, began with a paste of green walnuts which were then liberally salted and soaked in vinegar, strained, boiled, skimmed, boiled (again) with cloves, mace, ginger, nutmeg, pepper, horseradish and shallots, and then bottled. Vinegar, itself a preservative, eliminated the need for fermentation. By the early 1800s, tomatoes had been established in English cuisine, and so, naturally, they were being used as a base for ketchup as well. In 1810, Alexander Hunter (a physician) in Receipts in modern cookery provided a recipe for a Tomata Sauce that called for first baking the tomatoes, removing the peel and seeds, adding chili vinegar, salt, garlic and shallot. Then it was boiled, skimmed, strained and bottled. Catsup had arrived in the United States in the early 1800s as well. In his Cook’s Oracle (1830), William Kitchiner (also a physician) included several recipes for catsup that used alternately, walnuts, cockles, oysters and mushrooms as their bases. Interestingly, Kitchiner also used the word catchup throughout the book, but seemingly exclusively as a term for a mushroom-based sauce. Kitchener also had a couple of recipes for sauces that could have been (but weren’t) called catsups: Love-apple Sauce and Mock Tomata Sauce. Both of these were highly spiced with shallot, clove, thyme, bay leaf, mace, salt and pepper, and the latter, which apparently used apple, also incorporated turmeric and vinegar. Notably, while Heinz was selling both catsup and ketchup in glass bottles, the first to do so commercially was Jones Yerkes, who introduced the practice in 1837. Nonetheless, Heinz perfected it by first ensuring that it was in clear bottles so his customers could verify his product’s purity and, second, introducing the iconic shape so well-known today. If you hold a traditional Heinz bottle at about a 30 degree angle and patiently tap the 57 stamped on the neck, eventually the ketchup will flow beautifully. Physicists have another method, although it requires an explanation (of course). Because of its composition of tomato, vinegar, water, syrup and spices, ketchup is a “Non-Newtonian” fluid whose thickness and stickiness can be changed with force. Therefore, essentially all you have to do is “shake the bottle beyond its breaking point, and ketchup becomes 1,000 times thinner,” and, therefore, easier to pour. What’s the secret to pouring Ketchup? In the UK, there is just the word ketchup. “Catsup” isn’t used or generally known. Who on earth considers ketchup to be “low-brow”?